PARIS, France, December 10, 2015 (ENS) – Climate negotiators from throughout the world worked all night into Thursday morning to forge an historic agreement that will involve every country in a global effort to put the brakes on runaway climate change. Ambition, differentiation and finance are the three big issues that remain unresolved in the current draft text, issued this evening by French Foreign Minister Laurent Fabius, who is presiding over COP21, known formally as the 21st Conference of the Parties to the United Nations Framework Convention on Climate Change, UNFCCC. Delegations negotiated all day Thursday searching for compromises on the most stubborn sticking points – ambition, differentiation and finance. Each of these terms is a buzz-word wrapped up in a host of emotions, needs, desires and fears. 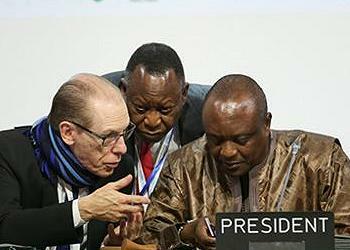 Ambition, to these negotiators, means the difference between 2°Celsius and 1.5°Celsius. Small island states, coastal developing countries and environmental groups have demanded that any agreement emerging from the Paris conference must restrict global warming to just 1.5°Celsius above the planet’s pre-industrial temperature. 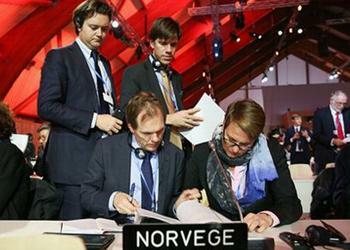 The previous temperature target, agreed at the 2009 UN climate conference in Copenhagen, was a 2°Celsius limit. In Paris, the United States and the European Union have joined with over 100 other countries, both rich and poor, in a “high ambition coalition” to work for an “ambitious, durable and legally binding” agreement that would be reviewed every five years. They envision an agreement that would recognize the below 1.5-degree temperature goal, map out a clear pathway for a low-carbon future, and include a strong package of support for developing countries, including delivery of US$100 billion annually as previously agreed. 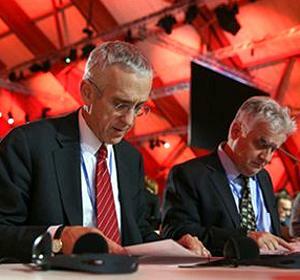 The lead U.S. negotiator Todd Stern, agrees that the 1.5-degree target should be recognized in the final pact. “We need beyond the below 2-degree target; we need to have a recognition of 1.5 degrees in the agreement, and we need a very strong and balanced transparency article so everybody knows what we are all doing,” Stern said. “This is our moment and we need to make it count,” said Stern. Differentiation means the differences between rich and poor countries. Finance means who pays and how much, who receives, and how the funding can help avert the worst consequences of climate change – droughts, floods, sea-level rise, ocean degradation, wildfires, diseases and the suffering of wildlife and humans alike. In the evening, COP 21 President Fabius distributed a newly revised text. Saying, “We are extremely close to the finish line,” Fabius asked the delegates to take the next two hours to examine the latest draft with “a new perspective,” keeping the final agreement in mind. Brackets remain around some of the most controversial parts of the outcome document, offering a range of choices “for the purpose of reaching balance, impartiality and reconciling differences,” Fabius said. As in all previous climate negotiations, the difference between rich countries and poor ones is the divide that makes agreement difficult. “I am convinced we will be able to find an agreement but to achieve this we need to join our forces, we need to unite our efforts, and we need to be guided by this need to achieve compromises,” Fabius said. Fabius has convened a team of 14 facilitators, government ministers, who are responsible for helping him throughout this week in order to ensure a successful outcome to COP21. A successful outcome would be one that resolves the fears of developing countries that the funds to help them cope will be made available and also keeps richer countries happy to be contributing. One delegate said that behind the scenes the highest UN leaders are exerting all their influence to smooth the path towards agreement, with UN Secretary-General Ban Ki-moon engaging in bilateral meetings with parties on key issues. Meeting with civil society groups today at COP21, Secretary-General Ban said he counts on grassroots organizations to help keep governments accountable, so they actually do what they have committed to do. 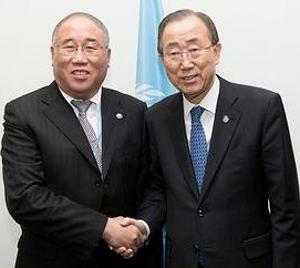 “One of the very valuable lessons that I’ve learned as secretary-general during the last nine years is that no government, no international organization, can do its work properly without active engagement and support from civil society,” Ban told members of nongovernmental organizations in Paris, alongside Al Gore, the former Vice-President of the United States and chair of the Climate Reality Project. 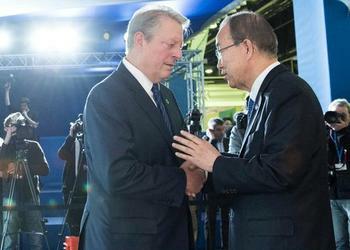 On behalf of civil society groups, Gore thanked the secretary-general for his tireless leadership and “constant dedication” to solve the climate crisis. As tension builds at COP21 and negotiators struggle to secure a final agreement, activists are mobilizing for a major “Red Lines” demonstration on Saturday in the streets of Paris. “The latest draft text has a lot of aspirational language, the real test will be what it means on the ground,” said Payal Parekh, global managing director of the U.S. nonprofit 350.org, which takes its name from the concentration of carbon dioxide in the atmosphere that scientists say will limit climate change. But there is already more than 350 parts per million of CO2 in the atmosphere, it’s closer to 400 ppm today. Over the last 48 hours, 350.org has mobilized hundreds of thousands of supporters online to send tweets and emails to key country negotiators and heads of state urging them to support an ambitious long term goal of full decarbonization by 2050 in order to keep global warming below 1.5°C. On Saturday, defying a ban on public protests that has been implemented in France under the State of Emergency following the November terrorist attacks in Paris, campaigners are planning for a gathering of thousands of people at noon on December 12. Participants will then place over 5,000 red tulips along the banners as a tribute to the victims of climate change and the fossil fuel industry, and their commitment to keep up the fight for climate justice after the Paris talks.